Dozens of far-right conservatives and hate group members held a rally on the west steps of the Capitol Saturday afternoon to protest what they perceive to be censorship by Facebook. 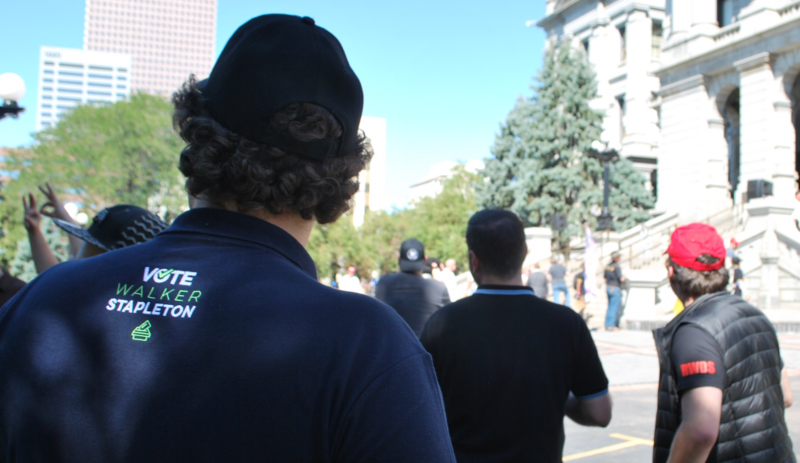 One Colorado Republican state rep helped produce the event and Walker Stapleton’s Super PAC was there to recruit staff. 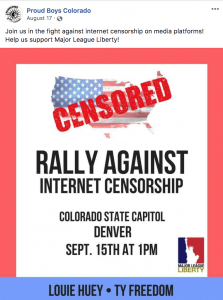 Officially titled the Rally To Protest Internet Censorship, the event drew approximately 60 people as well as 40 or so counter-protesters. 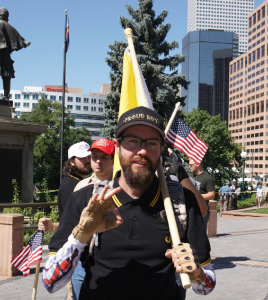 Nearly as many Colorado State troopers maintained a wide perimeter between those attending the event and those protesting it. 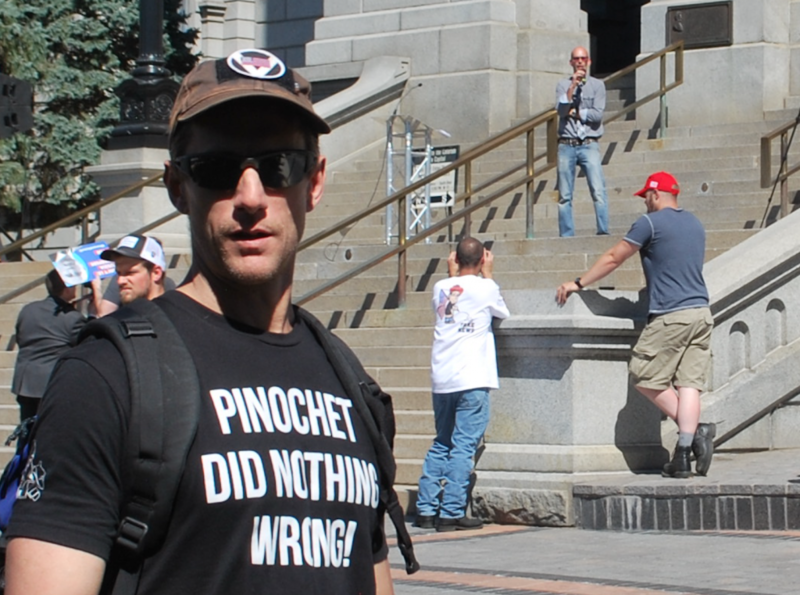 Two of the attendees sported a popular Proud Boys T-shirt that reads “Pinochet did nothing wrong!” with the letters “RWDS” on the left sleeve. The acronym stands for “Right Wing Death Squad.” The back of the shirt, kept covered by both men during the rally, depicts people being murdered by being dropped from a helicopter. Many of attendees wore protective clothing, from tactical gloves with hard plastic knuckles to helmets and various types of arm padding. One man sported a set of hockey pads. Two others wearing street clothes said they fought with some “black bloc” types in Civic Center Park on the way to the event, with one saying he was struck in the head by a baton. 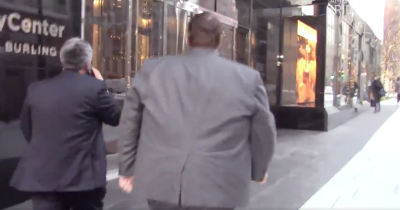 He noted that the attackers were not part of the protestor group on the sidewalk. 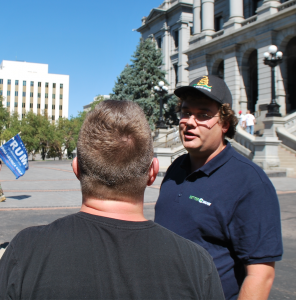 The rally was livestreamed by Major League Liberty as well as many attendees. UPDATE: The original title of this article has been changed to reflect the fact the Major League Liberty was the only official host of the event. This topic contains 2 replies, has 3 voices, and was last updated by iomegajaz 6 months, 1 week ago. All we need to know about the seething bias and red journalism being paraded on this web site. Nice pandering to your far left Communist audience. It’s important to differentiate between “SPLC-designated hate groups” and genuine hate groups; these are not the same thing… but that would require effort — beyond Google searching a group’s name and taking the SPLC’s horrendously biased opinion at face value — and is consequently eschewed by modern “journalists”.